Building upon the acclaimed NS7II, the NS7III continues Numark' œbest of both worlds approach by fusing the power of a Serato DJ-managed digital music library with the coveted response of a professional DJ turntable. With its three 4.3 full-color displays, the NS7III gives you real-time visual feedback from Serato DJ, virtually eliminating any time spent staring at your laptop during performance. The two outside screens provide vital track information including waveform, playhead, deck, and FX status, while the center display give you a dedicated view of your track library so you can find just the right track at any moment of your set. The center display can also be switched to display stackable parallel waveforms for complete beat matching control. Now you can manage all critical performance elements with the source laptop out of sight or closed altogether. Building upon the acclaimed NS7II, the NS7III continues Numark' œbest of both worlds approach by fusing the power of a Serato DJ-managed digital music library with the coveted response of a professional DJ turntable. With its three 4.3 full-color displays, the NS7III gives you real-time visual feedback from Serato DJ, virtually eliminating any time spent staring at your laptop during performance. The two outside screens provide vital track information including waveform, playhead, deck, and FX status, while the center display give you a dedicated view of your track library so you can find just the right track at any moment of your set. The center display can also be switched to display stackable parallel waveforms for complete beat matching control. Now you can manage all critical performance elements with the source laptop out of sight or closed altogether.Building upon the acclaimed NS7II, the NS7III continues Numark' œbest of both worlds approach by fusing the power of a Serato DJ-managed digital music library with the coveted response of a professional DJ turntable. With its three 4.3 full-color displays, the NS7III gives you real-time visual feedback from Serato DJ, virtually eliminating any time spent staring at your laptop during performance. The two outside screens provide vital track information including waveform, playhead, deck, and FX status, while the center display give you a dedicated view of your track library so you can find just the right track at any moment of your set. The center display can also be switched to display stackable parallel waveforms for complete beat matching control. Now you can manage all critical performance elements with the source laptop out of sight or closed altogether. 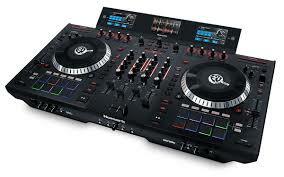 Numark NS7III 4-Channel DJ Performance Controller by Yunsshuang Electronics Co,Ltd at Pakbiz.com a premier Business to Business marketplace and largest online business directory. Find Numark NS7III 4-Channel DJ Performance Controller from Hong Kong complete basis & contact information, business offers, availability & related Consumer Electronics products. This page gives you information about the authentic sellers of this product. It allows buyers and sellers communication directly. It can also facilitate the buyers to purchase the product in reasonable prices.